Sweet and savory with a touch of heat. Quick and easy. 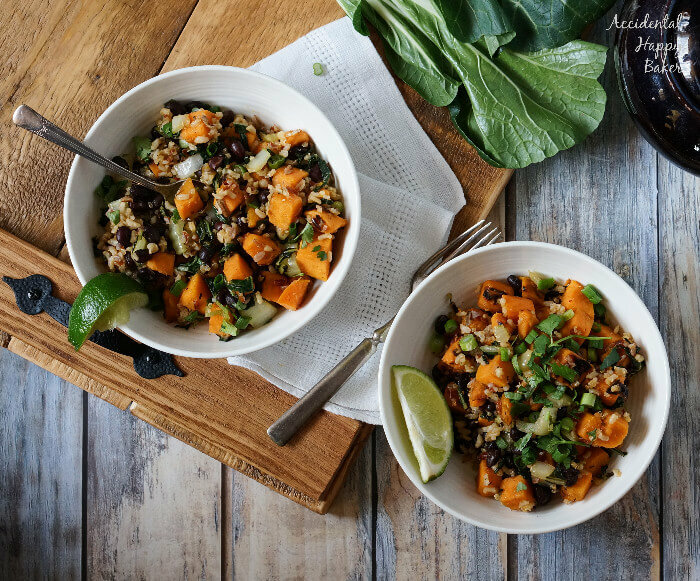 Full of sweet potatoes, bok choy, black beans, rice and topped with sweet chili sauce, these sweet potato sweet chili bowls are a vegetarian 30 minute one dish meal that reheats wonderfully. Tell me if you’ve ever had this happen– you see a stranger, someone you’ve never seen before and then suddenly you notice this person all over the place? I’ve been feeling this way about sweet potatoes lately. Sweet potatoes and I used to be basically strangers. We’d have them with dinner a few times throughout the year at my mother in law’s house. Then, suddenly I saw them everywhere and they looked darn good. I decided to give sweet potatoes another chance, a real chance beyond ho-hum Thanksgiving treatment and it turns out I really misjudged them. 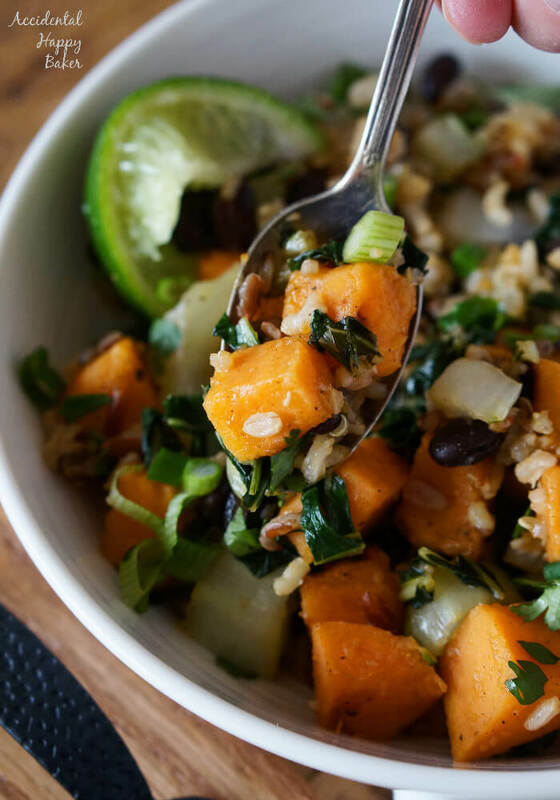 My new favorite way to eat sweet potatoes is in these sweet potato sweet chili bowls. Lately I’ve been all over the “bowl” thing as you might have noticed since I just posted my Hoppin’ John bowl recipe last week. But judging from the responses I got from you guys, I think you’re loving them too and there are so many reasons for them to be loved. 1) They are super quick and simple to make. 2) They incorporate lots of rice and veggies, which I love, that make them healthy and filling. 3) They are great for meal prepping and packing. 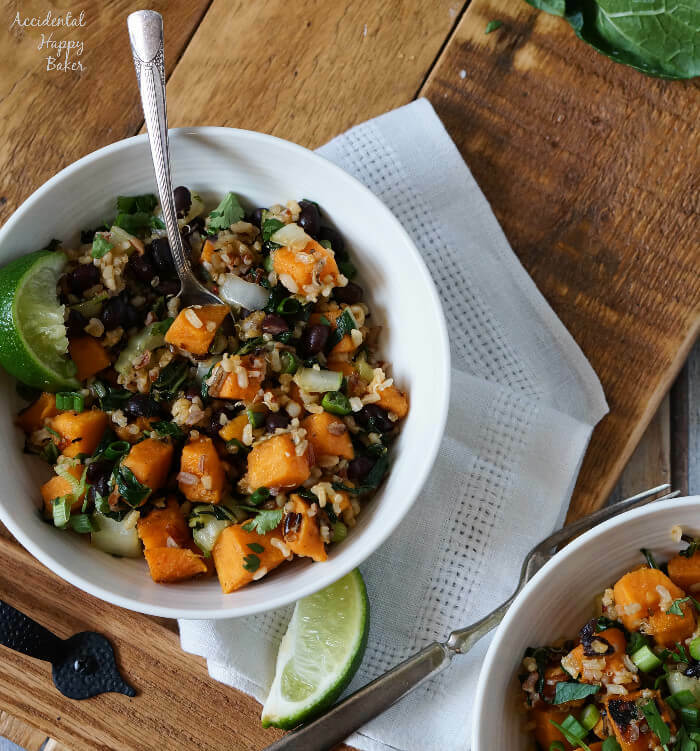 These sweet potato sweet chili bowls make a great vegetarian meal that even my meat loving boys enjoy and they are on the table in a flash. 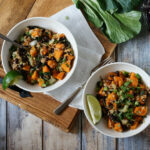 Full of sweet potatoes, bok choy, black beans, rice and topped with sweet chili sauce, these sweet potato sweet chili bowls are a vegetarian 30 minute one dish meal. In a large skillet or wok heat the olive oil over medium high heat. Then add the sweet potatoes and saute for 8 minutes, stirring occasionally. Add the bok choy to the pan and cook for another 5 minutes, continuing to stir occasionally. Add the black beans and leftover rice or quinoa and cook until heated through completely. Stir in 3 Tablespoons of sweet chili sauce. To serve, top with the sliced green onion, chopped cilantro and serve with a lime wedge. Your intro made me laugh out loud but yeah I know exactly what you mean!! And I love sweet potatoes too. Your chilli bowls look so good! Any day that I can make someone laugh is a good day! Hope that you’ll enjoy these bowls Kavey. I would happily eat comforting bowls like this all year round. Anything with sweet potato is good with me. I love how easy this is to make and I it would be the perfect meal to make ahead and grab on the go throughout the weekdays! I am definitely going to try this soon. Thanks for sharing! Hahaha! I gotta say, I sure am glad I stumbled on here through FBC – What a fantastic segue! While sweet potatoes are not strangers to me – I do keep noticing this fella almost every where I go – don’t know if at all – but he pops up at Starbucks, the grocery store, the post office…crazy! By the way, this sounds absolutely delicious – I thought I had a big enough breakfast that I could skip lunch but not after seeing these bowls! I definitely think that they’ve grown in popularity lately Shashi, but I can see why!